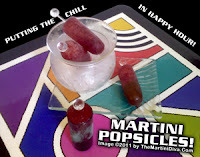 I've done frozen cocktails - what I call Boozesicles - a few times before, like my Pomegranate Boozesicles and my Grape Boozesicles. 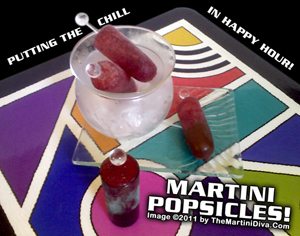 I've even done a few varieties of Martini Granitas, aka fancy, boozy shave ice! They're impressive, fun and a great summer refreshment or dessert that also counts towards happy hour! 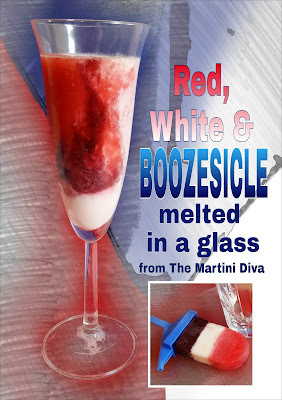 When I was invited to a Fourth of July party and asked to bring dessert I decided that I needed to up the ante on frozen cocktails and bring some serious red, white and booze to play. What I came up with was a refreshingly cool venture through three different alcoholic drinks on a stick. A RaspCherry Martini, a Coconut Colada and a Blueberry Margarita. 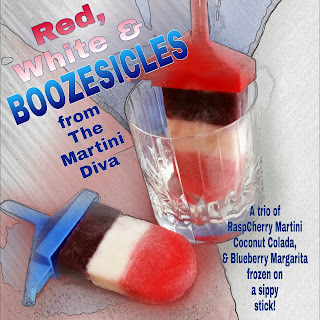 It's like a cocktail flight (a reduced-measure tasting selection) but frozen on a stick, a tasty and neat way to end a holiday cookout! 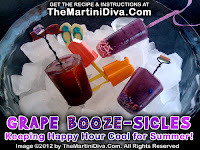 Especially if you can find the sippy straw popsicle molds I did, no dripping down the hand! Got kids coming? No problem, just leave out the booze, reverse the colors and use a different shaped mold so there's no confusion! 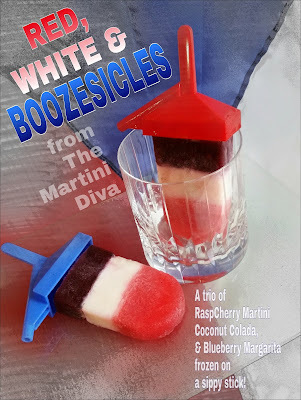 RED, WHITE & BOOZESICLES This recipe will make six standard popsicles. RED RASP-CHERRY MARTINI LAYER 1 Cup Frozen Raspberries Water 1/4 Cup Cherry Vodka 2 Tsp. Sugar 4 Drops Orange Bitters Fill a full cup measure with raspberries then add water to the top and add to your blender with the cherry vodka, sugar and the orange bitters. Blend it all up and pour into the popsicle mold 1/3 of the way. Freeze. BLUEBERRY MARGARITA LAYER 1 Cup Frozen Blueberries Water Juice of One Lime 1/4 Cup Blue Agave Tequila 2 Tsp. Sugar 4 Drops Grapefruit Bitters Fill a full cup measure with blueberries then add water to the top and add to your blender with the rest of the ingredients. Blend it all up and fill the balance of your molds to the top. Freeze.